Up in my mountain cabin during the holiday season I certainly long for that slice of whole grain fresh baked bread with my cup of coffee or tea after a round on the cross country skis. The only problem is that, well, I am on holiday and don’t feel like spending energy on kneading dough. I haven’t got a bread mixer up here and although I know that kneading dough can be therapeutic once you get into it, I’m looking for other, less demanding, ways to come up with a great loaf of fresh bread. Perusing the holiday season magazines, I stumbled upon an idea which I have subsequently tried out and found to work beautifully. 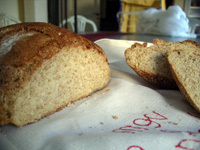 It takes time but not a great deal of exertion and produces wonderful, moist bread. This approach to bread baking is one that I call “Stretch and moisten” as opposed to “Knead, knead and rise”. The lead idea here is that instead of standing kneading for a half an hour and developing sore arms, you stretch out the dough with a moistened hand in half hour intervals. Continually splashing over water during the baking phase completes the process. 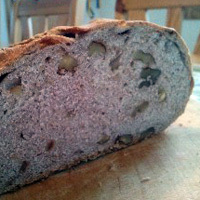 Here’s how to get a delicious walnut bread that everyone in the family will appreciate. Blend the yeast with the water. Add all other ingredients aside from walnuts. Using one hand, blend into a smooth dough. Add walnuts and knead until mixed into the dough. Before leaving the dough to rise for the first half hour, take the whole lump of dough into one hand and, wetting the other hand, draw out from one angle and fold back into the center. Repeat the same action until you have gone around the entire lump of dough. Leave to rise for a half an hour and repeat the same procedure. Do this a total of three times, leaving the bread to rise for a half an hour between each time that you stretch and moisten the dough. Eventually fold over the dough into a loaf and leaf to rise for an hour. Stretch, moisten and fold over the dough one last time, sprinkle with a little extra rye flour and leave to rise for another hour. Preheat the oven to 250 degrees. Place the dough on a baking sheet, sprinkle with water and bake 25 minutes, reducing the temperature to 200 C as soon as you place the loaf in the oven. Sprinkle with water two further times during the baking period. Remove from the oven and allow to cool. Enjoy! Based on the original recipe by Martin Johansson with some modifications to adjust to cup measurements. If you read Swedish, you’ll definitely want to check out Martin’s blog and his upcoming book, Enklare Bröd, about bread baking.